Sridhar Adepu holds a Masters degree in software engineering from National Institute of Technology Rourkela, India. He got his bachelor in computer science from the Kakatiya University, India. 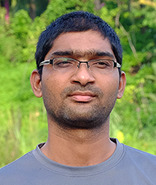 Prior to his PhD study, Sridhar was a Research Assistant at iTrust, SUTD. He also worked as Lecturer at Vignan University, India. Jonathan Goh, Sridhar Adepu, Marcus Tan and Zi Shan Lee, ” Anomaly Detection in Cyber Physical Systems using Recurrent Neural Networks”, Workshop on Security issues in Cyber Physical Systems (SecCPS) @ HASE2017. Best Paper Award. Giedre sabaliauskaite, Sridhar Adepu, “Integrating Six-Step Model with Information Flow Diagrams for Comprehensive Analysis of Cyber-Physical System Safety and Security”, The 18th IEEE International Symposium on High Assurance Systems Engineering (HASE2017). Koyena Pal, Sridhar Adepu, Jonathan Goh, ” Effectiveness of Association Rules Mining for Invariants Generation in Cyber-Physical Systems “, The 18th IEEE International Symposium on High Assurance Systems Engineering (HASE2017). Best Student Paper Award. Sridhar Adepu, Jonathan Goh, Khurum Nazir Junejo, Aditya Mathur, “Secure Water Treatment (SWaT) Dataset,” the 11th International Conference on Critical Information Infrastructures Security 2016. Finalist Award for CIPRNET Young Critis Award CYCA (by the European Union). Sridhar Adepu, Giedre sabaliauskaite, Aditya Mathur, “A Six-Step Model for Safety and Security Analysis of Cyber-Physical Systems,” the 11th International Conference on Critical Information Infrastructures Security 2016. Sridhar Adepu, Aditya Mathur, “Generalized attacker and attack models for Cyber Physical Systems,” The 40th IEEE Computer Society International Conference on Computers, Software and Applications COMPSAC 2016. Sridhar Adepu, Aditya Mathur, “Using Process Invariants to Detect Cyber Attacks on a Water Treatment System,” 31st International Conference on ICT Systems Security and Privacy Protection, IFIP SEC 2016. Sridhar Adepu, Siddhant Shrivastava and Aditya Mathur ” Argus: An Orthogonal Defense Framework to Protect Public Infrastructure against Cyber-Physical Attacks,” IEEE Internet Computing Magazine, Cyber Physical Systems Security and Privacy 2016. Eunsuk Kang, Sridhar Adepu, Daniel Jackson and Aditya Mathur, “Model-Based Security Analysis of a Water Treatment System,” 2nd International Workshop on Software Engineering for Smart Cyber-Physical Systems (SEsCPS’16), ICSE 2016. Sridhar Adepu, Aditya Mathur, “Distributed Detection of SingleStage Multipoint Cyber Attacks in a Water Treatment Plant,” The 11th ACM Asia Conference on Computer and Communications Security (ASIACCS 2016). Sridhar Adepu, Aditya Mathur, “An Investigation into the Response of a WaterTreatment System to Cyber Attacks,” The 17th IEEE International Symposium on High Assurance Systems Engineering (HASE2016).